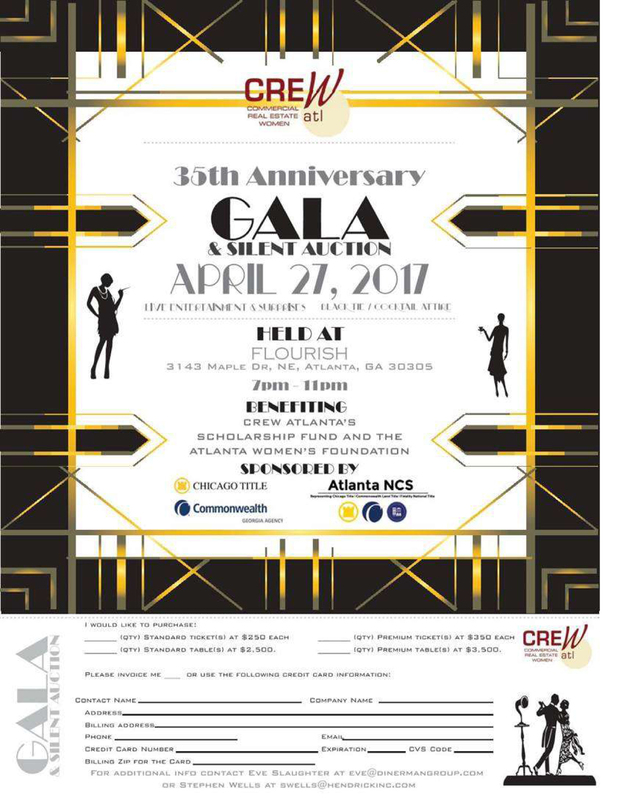 Turnkey Construction & Roofing is proud to sponsor the upcoming CREW Atlanta 35th Anniversary Gala to benefit the Atlanta Women’s Foundation, which is a 501(c)(3) non-profit organization with the mission to end generational poverty among Atlanta’s women and girls. 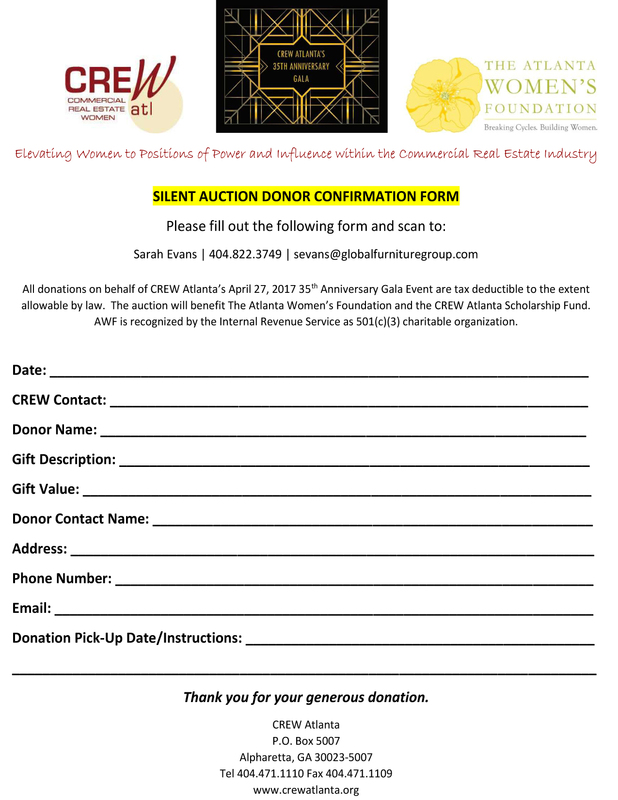 A small portion of the proceeds will also benefit CREW Atlanta’s Scholarship Fund, which provides scholarships to students pursuing a career in commercial real estate. The gala will be held on April, 27, 2017, at Flourish in Buckhead. Our goal is to raise over $30,000 this year with an attendance of 350-500 people! Through April 2017, we will be signing people and companies up for sponsorship packages and collecting items for the silent auction portion of the event. If you are interested in either or both, please contact us at customerinfo@turnkeyga.com or complete the attached forms. We are interested in all types of items, including but not limited to: travel packages, electronics, gift certificates for restaurants or experiences, wine/spirits, fashion, recreation and entertainment-related items and activities. We ask that the retail value of your donation be twenty-five dollars or greater. All donations are tax deductible. 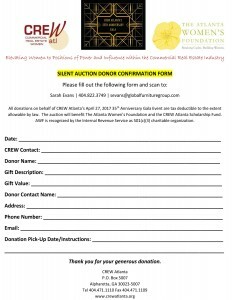 For your convenience, we have attached the gala invitation and donation form. We hope you can make it to the event this year as well (Thursday, April 27, 2017 at Flourish in Buckhead). Please see the attached invitation and link to register here: REGISTER FOR GALA HERE! It will be an amazing evening! 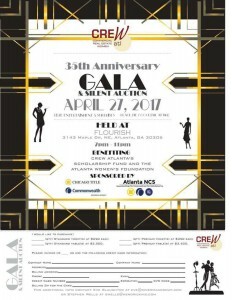 More information about The Atlanta Women’s Foundation can be found at www.atlantawomen.org and more about CREW Atlanta at www.crewatlanta.org. Thank you for your consideration and we look forward to your participation in this great cause!